A Vancouver-based website provides health information for refugees from other countries, to make it easier to get medical care in British Columbia. “Refugees already have so many barriers. There’s the barrier of language, cultural barriers, living below the poverty level,” says Dr Martina Scholtens, who created RefugeeHealth.ca. “Refugees generally come from a huge background of loss – their home, their country, wealth, their job, etc…Accessing health care is extremely difficult as it is…doing what you can to reduce or eliminate the barriers that can be eliminated is hugely important.” (quote from Website bridges cultures, languages in the North Shore News on Sun July 14, 2013). This website also has guidelines for health care providers who work with refugees in BC, including how to approach patients on first, second, and subsequent visits. It’s important for medical staff to understand the “refugee process” and know what their patients’ refugee status is. RefugeeHealth.ca is an excellent resource of health information for refugees in Vancouver because it offers translated educational handouts and community resources. The website offers cultural profiles of the main countries from which Canada receives refugees, and provides guidelines and tools for both patients and health care providers in BC. These tips aren’t from RefugeeHealth.ca or its affiliated health care practitioners. These aren’t tips for medical health care providers – there is a ton of information for practitioners working with refugees and immigrants on the internet! These tips are for people who have been forced to leave their countries because of war, persecution, or violence. I haven’t found any websites for refugees in Canada (other than the huge impersonal government sites), and hope this article becomes a place of healing and hope. It may take a long time to grieve the loss of your home, family, friends, culture, food, and habits of your country. You have experienced a trauma that takes a long time to heal, and you need to be kind to yourself. Anxiety and depression are common symptoms of being a refugee, even in a beautiful place like Vancouver! It’s important to take care of yourself emotionally and mentally, so you have energy to focus on your future in Canada. Are you struggling to cope with your grief? Read How to Let Go of Someone You Love. It’s important for some refugees to stay connected to their home country and mother tongue – while others prefer to cut off all ties. What communities or people help you feel secure and safe, here in Vancouver? Spend time with them. Avoid negative, pessimistic, or emotionally unhealthy people who make you feel sad, scared, depressed, or anxious. Who makes you feel happy and secure — and normal? Try to spend as much time as possible giving yourself what you need to heal and adapt to life in Vancouver. Vancouver Coastal Health and Fraser Health can be wonderful sources of health care in Vancouver and British Columbia, but they are huge systems with inadequate financial and economic resources. Whether you’re a refugee or Vancouver-born Canadian, you will get lost in the healthy care system if you don’t know how to speak up for yourself. We all need to learn how to advocate for ourselves to get health care in BC – and RefugeeHealth.ca is an excellent place to start! If you’d like me to write an article on how to advocate for yourself, please let me know in the comments section below. Do you feel overwhelmed, anxious, and exhausted? Read How to Ask for Help When You’re Depressed. I welcome your tips and thoughts below, whether you’re a refugee in Vancouver or a health care provider. Don’t worry about spelling or grammar – just feel free to write how you feel. 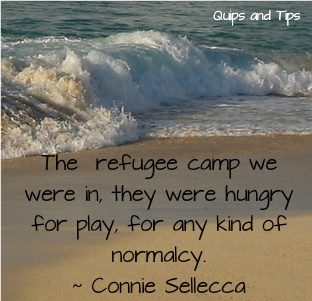 “The particular refugee camp we were in, they were hungry for play, they were hungry for any kind of normalcy.” Connie Sellecca. Thank you for your comments! I hope this article reaches refugees in Vancouver – I know they may not speak English, but I hope in some way it helps. I knew nothing about any of this. The post was very informative and eye opening.